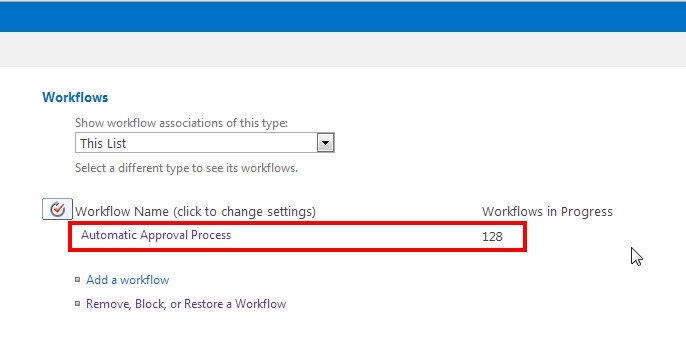 Do you have a really big list in SharePoint and has a workflow attached to it? Had you encountered an issue where this workflow suddenly stopped and left a good number of Workflows in progress? Have you ever wondered where do you find these workflows in progress? going to each list one by one will be OK if you have 10 items on your SharePoint List but if you have 1000 that can be a daunting task cancelling them all by going to each list item. Well things can be easier by using SharePoint Powershell where you can iterate to all list items that has workflows attached to them and cancel them programatically if they confirm to a certain condition, like when they are not “Completed” or “Suspended”. #Loop through all Items in List then loop through all Workflows on each List Items. You can also change the condition based on what your requirements are for a full list of what’s available please check it here.